Description Presentation copy of Illustriertes Katzenbuch signed by the Author, dated December 1896, published in Berlin, by Paul Parey. 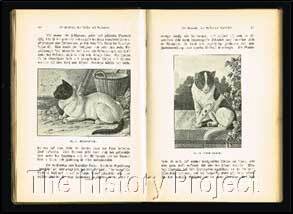 Brief History A now very rare German language book of early cat breeds, with illustrations and natural history, covering wild and domestic species, colour varieties and races (Breeds), including the now extinct Chinese Lop, the Siamese, the Angora, the Persian, and others. Illustriertes Katzenbuch, by Jean Bungartz. Jean Bungartz, (1854-1934), was born in Cologne, on 6th May, 1854; almost 30 years to the day after Harrison Weir, but although a much younger contemporary of Weir, he became in many respects, Weir's German equivalent. He was chiefly a naturalist, who worked as an illustrator, but had similar animal interests to Weir, covering Poultry, Pigeons, Ornithology, Dogs and Cats. His body of work is found predominately in illustrative book plates, appearing in both black and white, and colour; featured regularly in German language periodicals and natural history books. Like Weir, he also painted topical illustrations that were used on postcards, some based on Christmas and New Year themes, but mostly often associated with animals such as rabbits, racehorses, dogs, and a multitude of bird and wildlife studies. Probably his greatest claim to fame, was as a recognised expert on dog breeds, and his folio size book 'Illustrirtes Muster Hunde-Buch' published by J.M. Richter, of Hamburg in 1890; featuring 50 notable black and white lithographic plates, is highly considered as a classic work on dogs from this period. He was in fact, the founder of the Hamburg Society for the Promotion of Pure-bred Dogs during the decade prior to publication of this exceptional book on dog breeds. 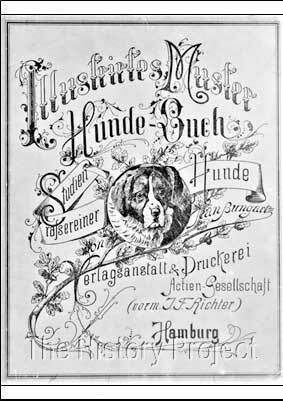 Above left: Title Page of 'Illustrirtes Muster Hunde-Buch' (1890) by Jean Bungartz. 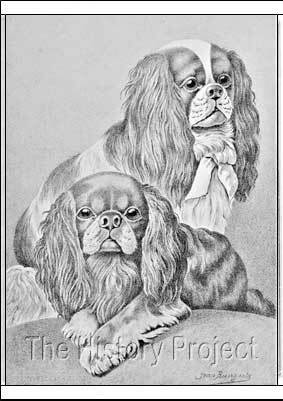 Above right: An image from the book, by Bungartz, featuring Blenheim Spaniels. His wildlife drawings were generally exceptional, showing a wide knowledge of natural history. His drawings of cats are few, and generally more formal, having perhaps a less natural appeal; possibly coming from having somewhat less of an affinity with them than his contemporary, in Weir. Nevertheless, his book Illustriertes Katzenbuch (translating as 'Illustrated Cat Book'), is an important record of the natural history of the domestic cat and of the early varieties of Cat Breeds, Colours and Patterns; including the well-known Angora and Persian long-hairs, the distinctive Siamese, and a unique record of the now extinct Chinese Lop. 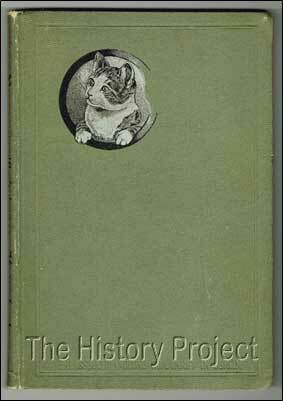 For this reason, the book is a rare treat, and very few first editions ever come up for sale. 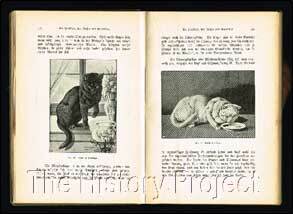 Sample Pages and Images from 'Illustriertes Katzenbuch'. Top: Variations on Colour and Pattern. Middle: Detail from The Angora, and the Persian. Bottom: Detail of The Siamese, and the Chinese Lop. Of special interest in the above set of sample images, are the developing differences between the Angora and Persian varieties, the very close short coat and distinctive pattern on the Siamese, and the long coat on the Chinese Lop, comparing favourably with the Scottish Fold Longhair of today, (aka the Highland Fold). 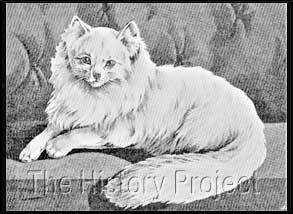 These drawings are therefore, an important historical record of what was the true status of these breeds in Germany at that time; and in the case of the Chinese Lop, a lost mutation, in a breed we can no longer observe in the flesh today. In January 1897, in a German family orientated journal, we find a full-page image of a grouping of Cat Breed varieties drawn by Jean Bungartz, providing yet another rare glimpse into the distant past. This piece is entitled 'Katzenrassen' which translates as 'Races' or 'Breeds' of Cats. 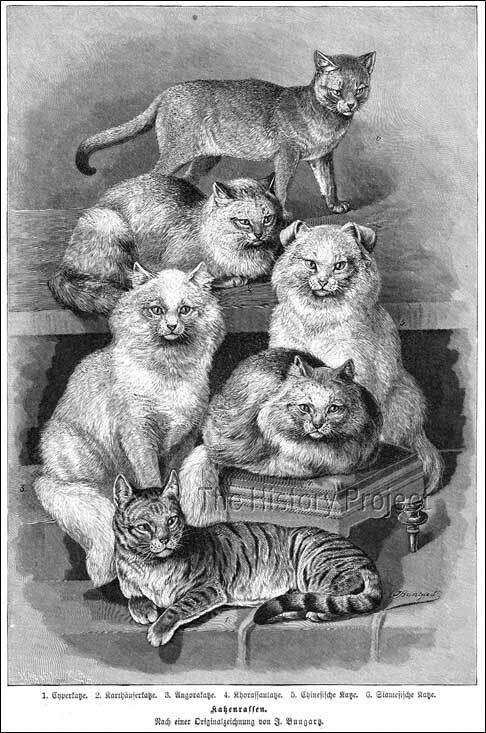 On the top shelf: Siamese, (looking decidedly ticked) followed by the Chartreux, (a Longhair), then from left to right; the Angora, the Persian on a stool, then the Chinese Lop, and lastly; the Cypress (or Tabby Shorthair). 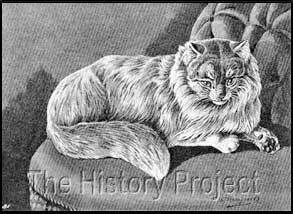 It is worthwhile observing that many illustrations of Chartreux from this period, show them as predominantly longhairs, while the Mackerel Tabby European Shorthair, is often listed simply as a Cypress cat. The only portrait of Jean Bungartz found to date, appears on the period business card shown below, courtesy of the Wikimedia archives. 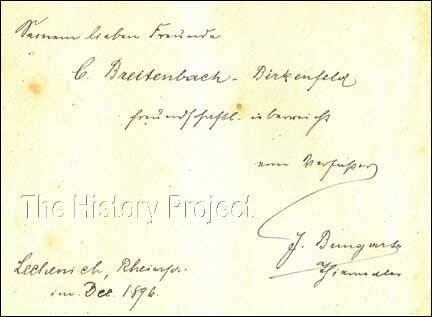 Below it, is shown the wording in the handwriting of Jean Bungartz, along with this signature, from the 'Presentation Copy' of his book 'Illustriertes Katzenbuch', one of two copies, currently held in archives of The Harrison Weir Collection. 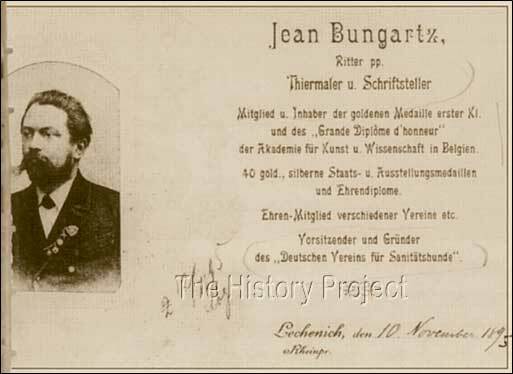 Business Card of Jean Bungartz, courtesy of Wikimedia Commons. Jean Bungartz died on 15th September, 1934, at Munster in Germany. 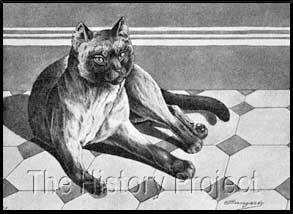 In delivering his illustrated Cat Book in 1896, he became the first German naturalist to complete a work specifically on the Domestic Cat and its early variations of colour and form. 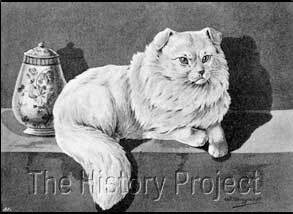 His talent as a naturalist artist has long stood the test of time, but it is equally important that his unique contribution to the world of the emerging cat fancy, be remembered and duly acknowledged. 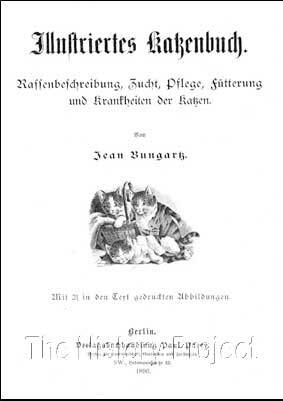 Illustriertes Katzenbuch (1896) by Jean Bungartz. Illustrirtes Muster Hunde-Buch (1890) by Jean Bungartz. Katzenrassen' Period Print, January 1897, by Jean Bungartz. Business Card/Portrait, (1895), courtesy of Wikimedia Commons. Source: Helmut Weingarten: Vor 100 Jahren starb Jean Bungartz. in: Jahrbuch der Stadt Erftstadt 1998. Presentation script and signature, (Dec. 1896) courtesy of The Harrison Weir Collection.